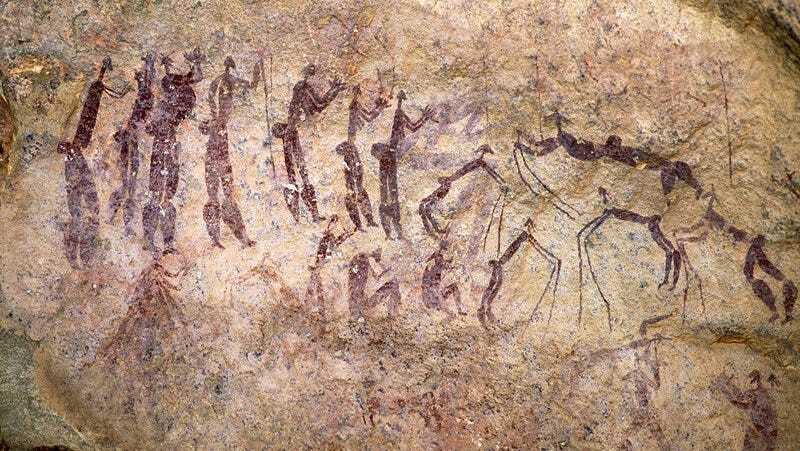 Cave art from South Africa. A new commentary paper published today in Trends in Ecology & Evolution is challenging the predominant view that our species, Homo sapiens, emerged from a single ancestral population and a single geographic region in Africa. By looking at some of the latest archaeological, fossil, genetic, and environmental evidence, a team of international experts led by Eleanor Scerri from Oxford’s School of Archaeology have presented an alternative story of human evolution, one showing that our species emerged from isolated populations scattered across Africa, who occasionally came together to interbreed. Gradually, this intermingling of genetic characteristics produced our species. Middle Stone Age cultural artifacts from northern and southern Africa. The new paper, instead of providing new evidence, provides a comprehensive review and analysis of what the latest scientific literature is telling us about human evolution, starting around 300,000 years ago. The researchers found that human fossils from different regions of Africa all featured a diverse mix of modern and more “archaic” physical characteristics. The earliest of these date back to between 300,000 to 250,000 years ago, and originate from opposite ends of Africa, stretching from the southern tip of the continent to its northernmost points. Many of these fossils were found with sophisticated archaeological items associated with our species, including specialized tools mounted onto wooden handles and shafts, and often utilizing different bindings and glues. These artifacts, like the diverse fossils, appeared across Africa around the same time, and studies of their distribution suggest they belonged discrete groups. At the same time, genetic data points to the presence of multiple populations. This is the great thing about science. New discoveries lead to new interpretations, which in turn lead to new suggestions on what scientists should study next. There’s still much to learn about our species and the extraordinary story of how we came to dominate the Earth.